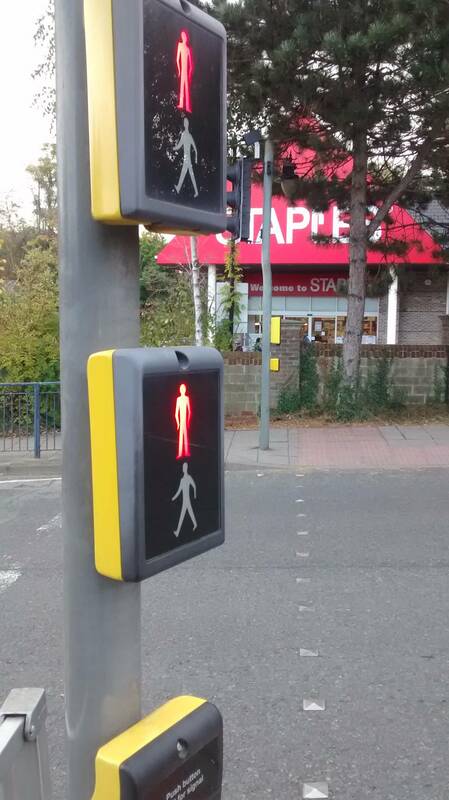 Why in the UK are there pedestrian crossings with two sets of indication signals - one above the other? This has baffled me for a long time: why pedestrian crossings are installed in the UK with two sets of cross / don't cross indicators - one above the other. On this set I saw recently it's not even consistent: at one end of the crossing there are two indicators - and at the further end there's just one ! Can anyone shed any light on this - is there some obscure accessibility reason for doing this ? 5.1.5 Drivers must have a clear view of at least one signal head on approaching, and when stationary at, the stop line. Where the view of the vehicular signals is reduced by the vertical or horizontal alignment of the road or other situations such as masking of signals in heavy traffic conditions or by overhanging trees, the conspicuity should be enhanced. This can be done, for example, by the provision of additional secondary heads, tall posts, building out kerb-lines if the carriageway width is sufficient or installing signals over the carriageway. Such overhead signals should be considered as supplementary to and not replacements for those listed as minimum in the relevant Regulations. If the overhead signal option is to be considered the problems of maintenance should be taken into account. 5.1.7 To assist blind and partially sighted pedestrians, as they approach the crossing, the primary push button/indicator panel should normally be located on the right hand side. The alignment should encourage them to face oncoming vehicles. The centre of the push button should between 1.0 and 1.1 metres above the footway level. 5.1.8 At Toucan crossings it is normal to install a push button unit either side of the crossing place at the height quoted above. Special arrangements may be needed if an equestrian push button is required. My guess is that the side of the road the picture is taken from, might be busy at certain times and therefore the lower signal not seen. 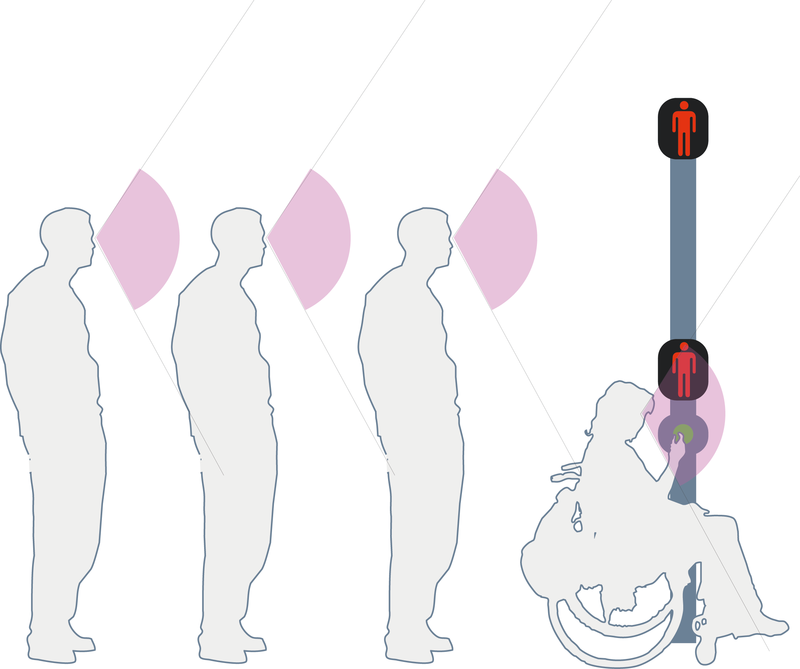 So an extra higher signal helps people who are farther from the post and might have others standing in front of the lower one. So my impression is that in order to provide solution to some problems as @Devin indicates, new problems arise and this is a solution to the second ones. Would a 'Processing' indicator on pedestrian crossing controls be helpful - and if so how would it be designed? Why are TV bezels there? Why are USB ports in laptops so close to each other?